Oh my goodness, I was going to post these weeks ago! How did I forget that, hmm. 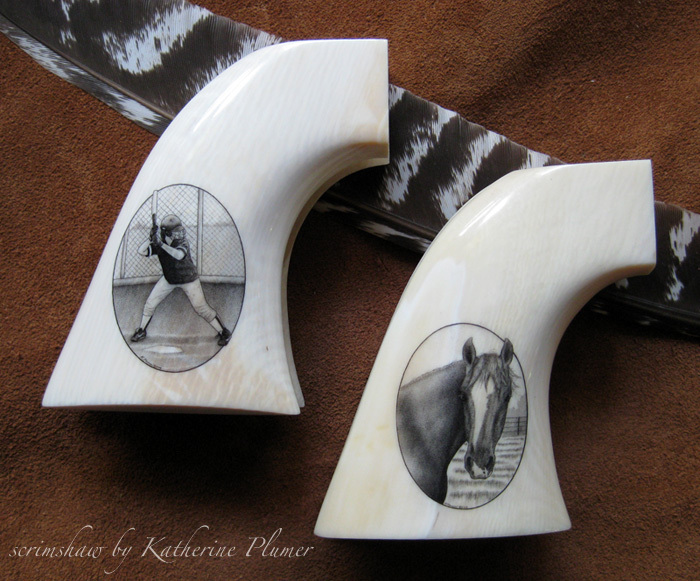 These were the "turkey grips" I was working on months ago. The guns were given for Christmas, so I'm allowed to show everything now. 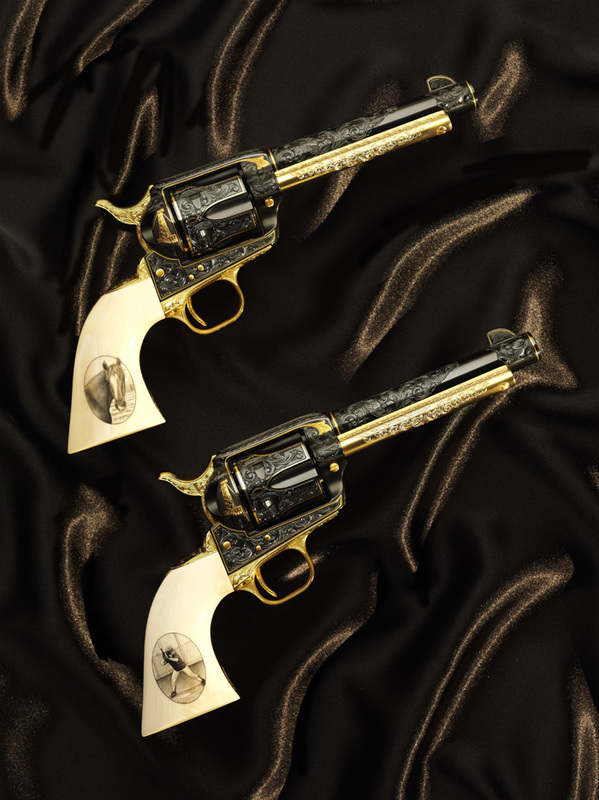 This project included two consecutively serial numbered 2nd Generation Colt Single Action Army Revolvers - .45 caliber 5-1/2” barrels. The client’s objective was to create twin Colts for his daughters that reflected evocative images of personal and family history. In the case of the father, an oil producer, the image of an oil derrick signifies a successful and rewarding career. Oil Derricks of his design and particular to his company are inlaid in 24 K raised gold on the leading gates. For the recoil shields the father choose 24K raised gold inlays of the athletic logo of The University of Kentucky, (Wildcats - circa 1970-78) his Alma mater. The daughter’s names and birthdates are engraved in script lettering on the backstraps and shovel heads. The engraving is classic Colt style scrollwork with background removed and dot punched. 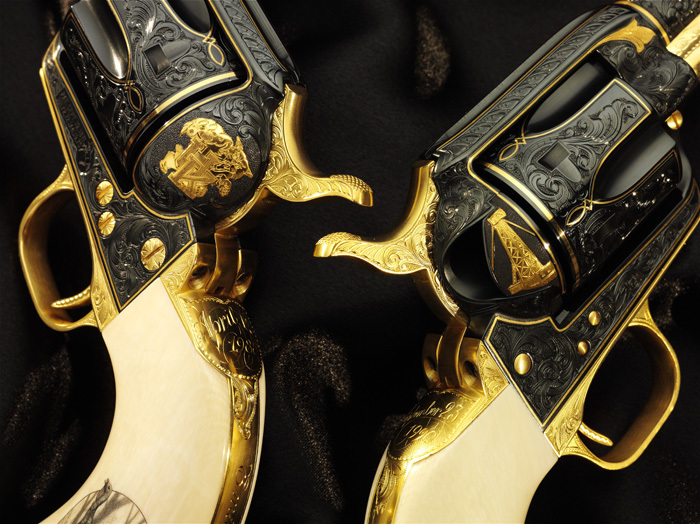 All borders, factory lettering and the Rampant Colt are inlaid in 24K gold. The Colts are presented in individual custom Oak and Glass Museum cases. Scrim Subjects: The father is an avid wild turkey hunter and a fan of the artwork of John J. Audubon. The goal was not at all to copy the work of Audubon, but to depict the toms in a similar manner; non-display pose and in their natural settings. On the other sides of the grips the images were more personalized to each daughter. One daughter plays softball in school, and this is her portrait. The other daughter loves horses and has shown and competed in horse sports. This is a portrait of “Little Red,” her beloved horse who died while she was away at college. Why does this make me think "Texas"? Get a grip, Katherine! Ha ha, I crack myself up! -BMc. 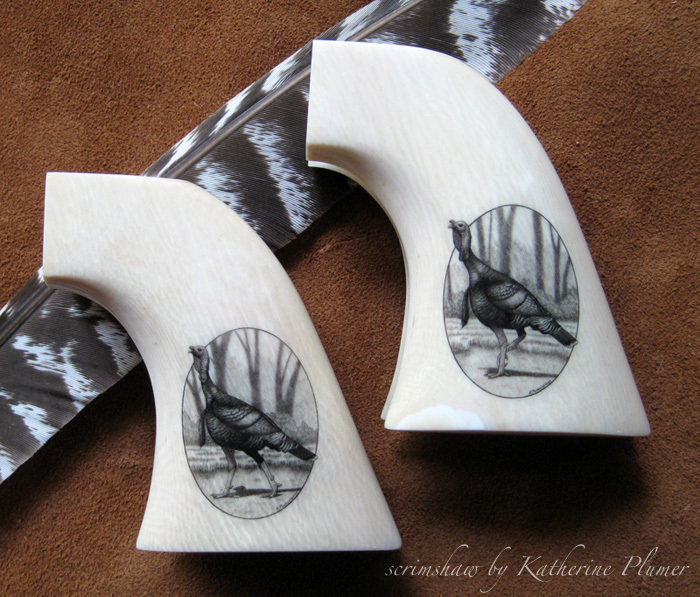 scrimshaw initials on Colt pistol grips!